Two weeks ago, the New York Times published an anonymous op-ed by a senior Trump administration official who was deeply concerned about President Trump's mental health and his authoritarian tendencies. Don Foster, a retired scholar who specializes in textual analysis -- and correctly identified Joe Klein as the author of "Primary Colors" -- thinks he knows who that person is. For the New York Times to publish such an op-ed, and for a White House official to warn the American people and the world about a dangerous president is unprecedented in the country's history. But the article was not surprising to at least one person. Bandy Lee, a professor of psychiatry at the Yale University School of Medicine, says she was contacted last year by White House insiders, who were "scared" that the president was "unraveling." Lee has been tracking the apparent decline in Donald Trump's mental health for several years. She has convened a conference on the obligation of mental health professionals to warn the public about the dangers he represents, and is also the editor of the bestselling book "The Dangerous Case of Donald Trump: 27 Psychiatrists and Mental Health Experts Assess a President." Will Donald Trump's mental health continue to decline? In what ways is special counsel Robert Mueller's investigation exacerbating Trump's apparent mental and emotional unraveling? How do collective narcissism and violence tie Donald Trump to his supporters? Are Trump's authoritarian impulses connected to his mental health? Is the safety of the world imperiled by Donald Trump's access to nuclear weapons? What was your first reaction when the New York Times published the anonymous op-ed by a White House official? I was struck by how the op-ed was being treated as such a big deal. I think it’s admirable that the writer chose to divulge the information about Donald Trump's very dangerous and worrisome behavior. But in many ways Trump's behavior was expected. As mental health professionals, we see the psychological symptoms in process so the result and outcome are very often not that surprising. So as events unfold, it’s merely a playing out of what was inevitable with Trump's paranoia and trying to hunt down the person in the White House who wrote the New York Times op-ed. You have said that two officials in the White House actually reached out to you last year with their fears about Donald Trump's mental health. That occurred during October of last year. There were two phone calls saying that these persons were from the White House. They seemed very credible and very genteel over the phone. They were very respectful. They were calling because they found me to be credible based on the book I edited about Donald Trump's mental health. These people were trying to figure out a solution and really just asking for help. The anonymous New York Times op-ed is a cry for help -- which is how I read it as a mental health professional. It's all very understandable, in a way, because mental impairment can be quite overwhelming and powerful in ways that regular people who are not used to seeing such mental symptoms can be caught unaware. They will also often be left at a loss as to how to respond, because the mental health symptoms being reported about Donald Trump can overcome healthy individuals through their sheer force. So much of this is predictable from a clinical standpoint. Trump is not going to get better. What are his symptoms? Donald Trump has shown a number of symptoms which are now quite obvious to even an untrained person. He is impulsive. He is reckless. He has shown a lack of empathy and a lack of concern about consequences. His grip on reality is loose. I suspect he is unable to tolerate reality for what it is. So, Trump has to make himself into a person who is infallible and an expert on everything. Therefore, when reality does not comport with his emotional needs, he has to fabricate his own version of reality. Trump has also shown a tendency of needing to present himself as being strong and powerful. He is constantly preoccupied with his self-image, he is unable to tolerate criticism and he lashes out when there is a hint of anyone being against him or challenging his authority. The truth of the matter is quite the opposite. Trump's behavior is a sign of weakness, not strength. Is Trump's behavior somehow strategic, as a means of keeping the public and his political enemies confused? Or is this all just impulse and instinct, a sign of his mental instability? Both elements are at work. He tries to strategize. But when someone is behaving in a way that is caused by their mental impairment, their behavior becomes predictable and rather rigid. Normal behavior is actually very wide-ranging. You can choose not to behave a certain way, you can change your method, you can change your responses. That's a more healthy response. In Donald Trump's case, we find that his responses are almost always predictable. For example, the denial of any failure or error in Puerto Rico. That can be very effective, and therefore be mistaken for strategy. But it is actually impairment. Donald Trump can't, for example, decide to think more carefully or respond more thoughtfully to events. He simply reacts. That is one of the ways that we can determine that his behavior is more of a symptom than a thoughtful strategic response. This makes Trump vulnerable to being manipulated by a foreign power (or others) who do not have the American people's best interests at heart. Those who have figured out that Trump is predictable can stroke his ego or present themselves as being "strong men," autocrats and the like -- he will start to worship you and behave in ways that are advantageous to you. This is why I believe Trump has been so difficult to remove through the 25th Amendment, impeachment or other checks and balances, because he is so amenable and easy to manipulate. This means that all variety of extreme policies which wouldn't have passed under a healthier president are possible under this one. So the psychological and emotional issues actually play into his authoritarian behavior and his demagoguery? Authoritarian behavior is actually pathology. It is a certain set of traits which makes individuals vulnerable to being controlled. We think of authoritarian behavior as being strong and confident, but actually it's more obsequious. There is a whole population following the authoritarian and being loyal to him no matter what. He leads them to destruction and the end results are almost always quite devastating -- which is why it's actually not a healthy situation. A system like despotism or tyranny or fascism is really not a political ideology so much as a collective state of poor health that leads eventually to harm for the collective body. I have argued that Trump leads a political cult tied together by racism and other antisocial behavior, and that it is all evidence of collective narcissism. Trump is personally violent and has also encouraged violence by his supporters. He thrives on fear and anger. Trump stokes that to his advantage. One of the reasons that my colleagues and I said that Trump was dangerous during his campaign was because he incites violence. He is attracted to violence. Trump will continually wish to either provoke or be drawn to violence himself -- such as starting a war, even a nuclear war. Nuclear weapons will be especially attractive to him because of their destructive power. That power won't deter Trump, but rather may draw him to more violence. It is all connected. The incitement of violence in the population, the attraction to war and division, and powerful weapons. There has been an increase in hate crimes, beginning with Trump's campaign and through almost two years of his presidency. Bullying among children has increased. There are mass shootings. Violence seems to be spreading in Trump's America. Pathology itself is spreading. It can be seen as something that's contagious. Violence is learned behavior. So when you present violence as a viable response to conflict -- and not only do you reward people who act violently, but you glorify it and show it as a valid means of resolving problems -- then yes, there's plenty of evidence showing that children will learn to be violent. This is a predictable consequence of rewarding not just an aggressive violent person to the office of presidency but also the rhetoric he uses and the climate he encourages. The greatest danger that Mr. Trump is posing to our nation at this point and internationally is the culture of violence that he's laying the groundwork for. There has been an escalating gun murder rate since Trump's campaign and presidency. There are also the highest gun murder rates in 25 years and epidemics of suicide which are at the highest levels in decades. You and your fellow mental health professionals have continued to issue public warnings about Donald Trump's danger to the country and the world. What are some of the specifics? We recently put out a statement that special prosecutor Robert Mueller’s investigations are likely to provoke Donald Trump into taking extreme and dangerous measures to try to distract the public. The same would apply with the revelations that are coming forth with Robert Woodward's book or the New York Times op-ed, his diminishing popularity -- all these things are going to be additional stresses on an already stressed presidency. His level of lying -- it's already at a pathological level, but the Washington Post noted that his rate of lying has quadrupled. In other words, in the first six months of this year he lied twice as much as he did in the entire preceding year. All those are signs of deterioration: His increasingly angry tweets, his resorting to more and more fantastical versions of reality, his conspiracy theories -- the deep state and so forth. These are signs of deterioration and we're treading dangerously close to something devastating happening. When we make predictions, we’re not saying that something will definitely happen, but when the probability exceeds a certain level of acceptability, then mental health professionals have a duty to warn and to alert the public. That's why we've been speaking up all this time, but the situation has become much more dire. It is unfortunate that we don’t have a political solution at this point. The correct response and treatment would involve containment -- and denying Trump access to nuclear weapons. How does Trump's denying that thousands of people were killed in Puerto Rico from Hurricane Maria reflect his mental health? Likewise, on the anniversary of 9/11, Trump was acting inappropriately as well, celebrating and congratulating himself as he got off Air Force One (photo at left). That just shows how Trump lacks basic human qualities. This is actually a very debilitating, impairing condition where he is unable to have empathy for other people. Trump is so focused on himself, and probably always preoccupied with protecting himself and survival of the self. Those of us who have a basic sense of self-worth, and are grounded in our ability to accept ourselves and to see ourselves as being significant, don't have need to constantly be on guard or constantly attack imaginary threats. It is all revealing of his level of fragility. Trump doesn't seem to have an internal sensor that says, "This is wrong". Instead it is just literally, “Here's what I feel. I'm going to do it." Trump doesn't have that internal restraint. He has to constantly guard himself unless he's getting perpetual adulation and approval from others. He truly feels as if he's catastrophically in danger of losing himself. That is why something like a devastating nuclear war would not be inconceivable to him. Trump has built himself up to be as the undefeatable, powerful, all-knowing person. If that façade were to crumble, then it will feel as if the entire universe were crumbling as well. 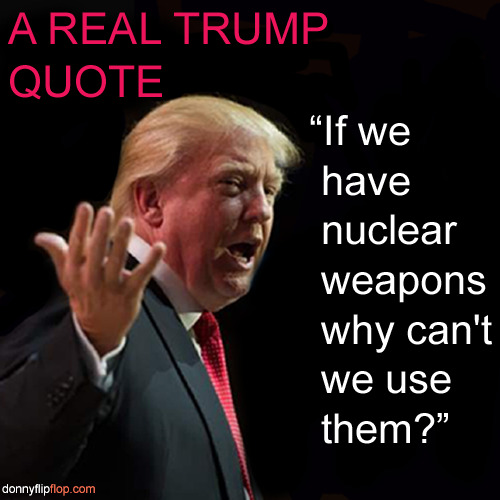 It would become very attractive for Trump to launch a war or to use nuclear weapons. All his actions are in preparation for something like a nuclear war. I wouldn't be surprised if that would be the first place he goes. This is quite beyond the imagination of most people. We can't even conceive of that being a response, let alone a response that we would take, because a normal person would think about the level of devastation and the consequences. But Donald Trump is unable to think of consequences, as far as we can tell. Trump has shown a detachment from reality, and of being someone who has shown a severely impaired ability to be empathetic. Trump also has shown a level of cruelty and pleasure in inflicting pain on others. Everything is going in the direction of something very harmful and devastating. It's only a matter of the stress rising to the level where Trump would make such a decision, to start a war or use nuclear weapons. This is a very dangerous situation. But ordinary people will tend to think that “Well, he won't go that far, he won't do this.” In other words, he wouldn't destroy himself and human civilization. That's an assumption on our part based on normal behavior. What mental health professionals can perhaps do for society is to educate the public on how serious the signs Trump is manifesting really are. Mental health professionals routinely assess, treat and contain individuals like Donald Trump on a daily basis. It's routine. There are medical standards of response, even if it is not happening at the political level where it should. 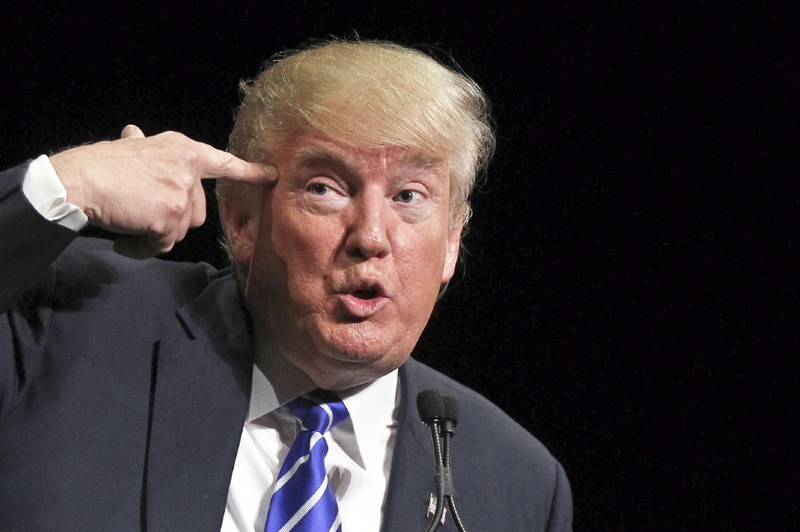 Usually, with an individual like Donald Trump you need an urgent mental health evaluation. This has not happened yet, even though the need for one was indicated long ago.